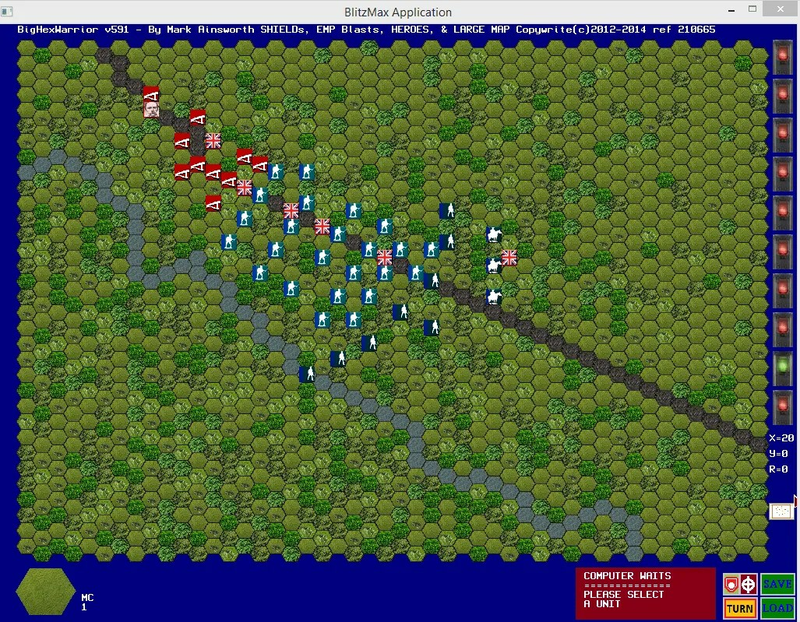 It has been a while since I’ve posted an update to Mark Ainsworth’s turn-based tactical wargame HexWarrior. This hasn’t been due to a lack of activity on his part, but on mine. This post will attempt to provide an overview of some of the significant changes that have been made to the game since 2.26. The current version is 5.91D. Download the game here. Addition of another version that removes AI allowing for board wargaming. Now supports shields for space games. Added the ability to copy and paste units while creating scenarios. Added the ability to paste in hex tiles while creating scenarios. Help files have been moved into their own sub-directory. The Getting Started Guide has been significantly extended. Added the option to view units facing info. Added a faster movement option which avoids some opfire. Defenders outflanked receive a penalty in combat calculations. The ability to jump to different locations on the map. The ability to rotate units. Toggle option for reactive fire on/off. Addition of a Space Battle scenario. Previous story Operation Barbarossa Updates.